In line with the philosophy of “Respect for the planet”, the employees of Toyota Kirloskar Motor (TKM) volunteered for a cleanliness drive under its Corporate Social Responsibility initiative to beautify Bangalore city and make public places cleaner. In an endeavor to create better surroundings, Toyota Kirloskar Motor (TKM) today conducted its sixth activity under ‘ICARE’, an employee voluntary initiative to paint the Nayandahalli flyover and spruce up the junction. Toyota aims to spread awareness on the importance of clean environment and undertake clean-up activity in one of the busiest and largest junctions in Bengaluru. More than 150 Toyota employees jointly participated towards making Bangalore city cleaner and beautiful. This CSR move by TKM has been in partnership with The Ugly Indian group to bring out a larger gathering [a total of 300 volunteers including Toyota employees and Ugly Indian volunteers] for a common social cause, transforming the select city junction into a clean environment. The activity was divided into two phases. 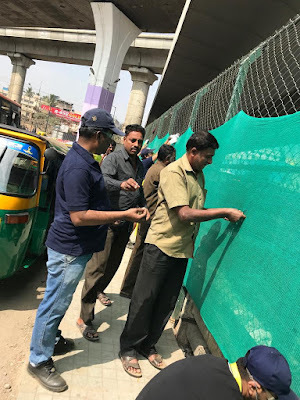 Firstly, beautification of the flyover walls and pillars through painting and designing murals and secondly repairing of the space below the flyover which is mainly used as parking space. In order to provide a feel-good factor to the road users, the volunteers also blocked the visibility of the drains around to ensure clean space around. With a view to scale-up the active implementation contributing to nation’s mission of “Swachh Bharat Abhiyan”, TKM concerted efforts enhances the spirit of cleanliness in the community around and provides optimum developmental benefits from such initiatives. Speaking on this initiative, Naveen Soni, Vice President - Toyota Kirloskar Motor said, “At Toyota, we believe in giving back to the society we live in through integrated strength. Our objective is not only manufacturing ever better cars, but also enrich community lives. As a responsible corporate citizen, we want to instill cleanliness as a mindset among the citizens of Bengaluru through this fun-filled activity. Cleaner public places and a beautiful city is desirable to all and we are trying to achieve that in our own ways. We believe in the philosophy ‘Grow together’ and thus focus on the community around us. We at Toyota would like to further enhance the Beauty of the Garden City which Bengaluru is known as, to its true sense. ‘ICARE’ is driven solely by the passion of our employees and shared responsibility to make a big difference in the society we live in. These kinds of activities empower our employees to be the change makers in the community and support them grow as individuals with real understanding of the social issues around them. Our employees have been actively involved to drive many CSR interventions in the areas of health, environment and education.” He added. One of Toyota’s global CSR priorities is to protect the environment and reduce the amount of harm done to it, by instilling eco-mindsets in children and the community. Under its Environment initiatives, Toyota has developed an Eco Zone to create a biodiversity zone where children can observe and learn about the environment beyond classroom, while communities will evidence the environment conservation in person. With Eco Zone, Toyota Kirloskar is promoting “Harmonious co-existence” of humans and nature through various eco-activities. Eco-Zone has been developed in the premises of TKM manufacturing plant. It is an open-air learning center, designed for eco-experiential learning for students. It is spread across an area of 25 acres alongside 500KW solar park. As a part of the water conservation and environment drive, TKM adopted a lake (Abbanakuppe) in the vicinity - a first of its kind project, with an objective to protect the natural resource. This Lake Rejuvenation project is planned to run in collaboration with local community to ensure the sustainability of the lake. The objective is for the community to take ownership of the lake to ensure they have a supply of safe drinking for years to come. Four villages in the vicinity will be benefitted by this lake. With GreenMe initiative, TKM is working with students, teachers and community to create pro-environment behavior in terms of water, waste, climate change issues, using environment education as a tool. Children are engaged through activity-based module focusing on the change in the mindset. Our CSR’s main objective is to nurture the young minds and to spread the awareness from child to community in various focus areas of Education, Sanitation, Health, Road Safety and Environment. Through varied CSR projects, Toyota has touched more than 11,00,000 lives. Toyota will further continue its various CSR interventions from a longer-term perspective and development of socio-economic stature of the society, touching many more lives to make a difference in each one’s well-being.